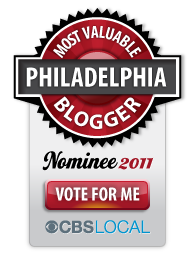 Home / CBS Philly / Contest / MVB / We're a Finalist in CBS Philly's Most Valuable Blogger Awards! We're a Finalist in CBS Philly's Most Valuable Blogger Awards! Vote every day! =] If we win, that means cool stuff for you guys too! Let's do it!